This book will be most useful to undergraduates in upper-level astronomy courses and graduate students taking Stellar Interiors or Stellar Atmospheres, as well as instructors of such courses. This book is based primarily on lecture notes for a two-semester sequence of courses at Minnesota State University, Mankato: Stellar Astrophysics and Stellar Structure and Evolution. The courses, which were offered every other year, were taken by astronomy majors during their junior or senior years; these students were expected to have completed the three-semester Calculus sequence, Differential Equations, the General Physics sequence, the first semester of Modern Physics, and the sophomore-level Astronomy and Astrophysics sequence. Depending on the timing, students may or may not have been exposed to upper-level courses in Mechanics, Electricity and Magnetism, and Quantum Mechanics. Thus, some of this material would have been seen before, but normally not in the depth presented here. This course sequence was intended as part of the student's preparation for graduate study in astronomy or astrophysics, and it was expected that much of the material would be covered again at that time. The focus of the book is on understanding the material in the courses, rather than just memorizing it. Wherever possible, derivations of equations are presented, with sufficient intermediate steps to lead the reader safely through the mathematical maze. In this way, the student will comprehend why and when approximations have been made and/or certain terms or factors have been ignored; this is important because it is necessary to understand the limits of the equations being developed in order to properly apply them. Additionally, it is useful for the student to be able to adapt existing equations to solve new problems. Most of the material contained in this book has been covered by many other authors; this is not a completely new set of basic principles, equations, derivations, and results for use in understanding stars. Rather, it is a somewhat different organization of the standard collection of material, based on the order in which it is presented in the two courses involved. Neither an atmospheres/interiors split nor a principles/applications division has been used to allocate material to the two courses or to partition the book; instead, the approach is to develop and utilize topics as needed, such that the text flows smoothly from chapter to chapter in a logical order. Notes on Stellar Astrophysics by James N. Pierce is licensed under a Creative Commons Attribution-NonCommercial-NoDerivs 3.0 Unported License. Based on a work at http://mavdisk.mnsu.edu/wp5884kt/nsa/nsa.pdf. 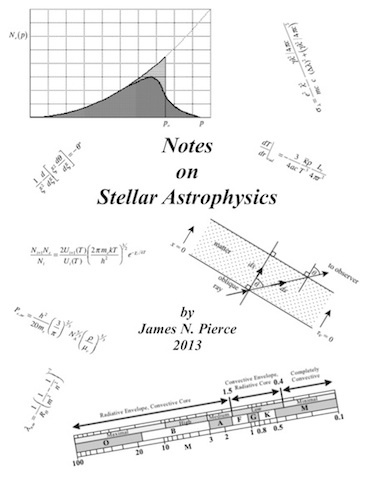 View the complete Notes on Stellar Astrophysics pdf (22.5 MB). If you like the book, send me an email. Back to Dr. James Pierce's home page. Back to Dr. James Pierce's Physics & Astronomy home page.